Incorporating more than 40 different types of California native plants, the Stevenson property takes full advantage of our state’s rich botanic diversity to create a distinctly Californian sense of place. The landscape plan integrates water conservation design with low water use native plant choices to serve as a model of beauty and sustainability. 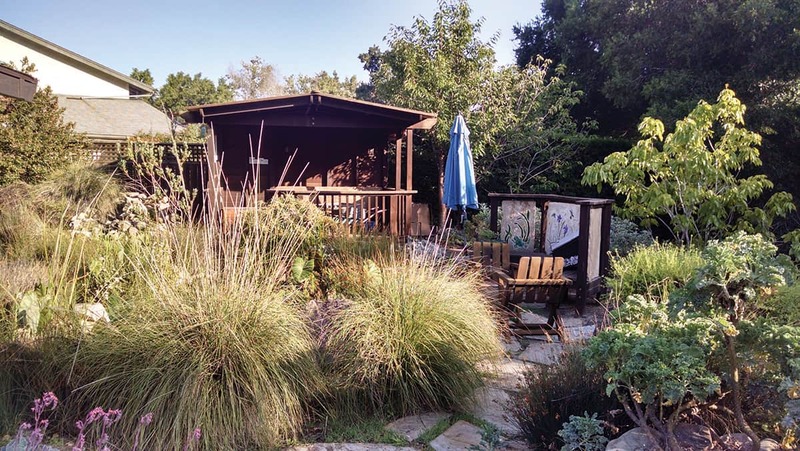 With that in mind, The Santa Barbara Botanic Garden is pleased to present this year’s Native Choice Award for leadership in the use of California native plants to Martin and Elizabeth Stevenson for their residence at 845 Norma Way. 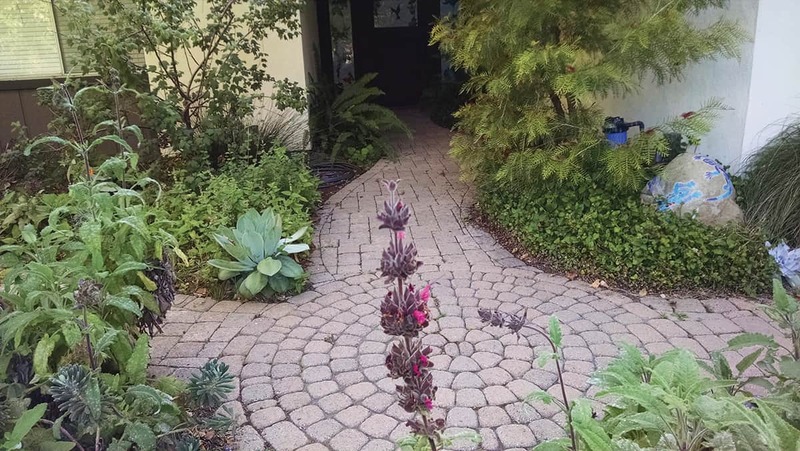 Situated between two forks of San Jose Creek, the Stevenson’s approximately 10,000 square foot property serves as an inspiration to homeowners who would like to replace their lawn with a more creative and water thrifty design. Like many Santa Barbara residences, this property was formerly landscaped with non-native ivy groundcover in the front yard and non-native hedges and a lawn in the backyard, all irrigated with sprinklers. 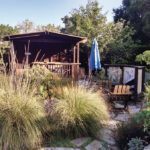 Now this space is filled with more than forty native plant species (primarily Santa Barbara-South Coast genetic stock), including groundcovers, shrubs, aquatic plants, trees and wildflowers. Together these beautiful natives offer year round color, texture and variety while providing habitat and food for local wildlife. In working with the Stevensons, Daniel Wilson, president and founder of Wilson Environmental Contracting, focused on water conservation. Sprinklers were eliminated and much of the site’s water supply now comes from carefully redirected roof runoff moving through sculpted soils to become cistern-stored rainwater. Supplemental irrigation, when needed (approximately every 22-25 days), is delivered via drip emitters. 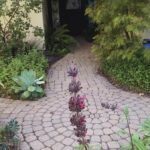 All hardscape is permeable and includes cobble driveway, unit paver patio and paths, and mulched or decomposed granite paths. The property is heavily mulched with on site recycled wood chips created from a non-native sycamore species which was removed. Native plants Wilson selected for the Stevensons include: giant chain fern, holly-leaf cherry, ironwood, currant, chaparral currant, mountain mahogany, quail bush, old-man sage, white sage, five kinds of buckwheats (California, desert, island, sea-cliff, and St. Catherine’s lace), two kinds of dudleyas, monkeyflower, three kinds of manzanitas (Howard McMinn, Sunset, Carmel Sur), groundcover ceanothus, textile rush, deergrass, hummingbird sage, woodmint, Island alum root/coral bells, scouring rush, iris-leaved rush, yucca, snowberry, barberry, four kinds of aquatic plants (spike-rush, rush, cattail, sedge), and California poppies. The Santa Barbara Botanic Garden is a private nonprofit charity that has been conserving California’s native plants for over 90 years. Founded by eminent plant ecologist Frederic Clements in 1926, the Garden is one of the nation’s oldest botanical gardens focused exclusively on native plants. It’s innovative platform was the combination of public displays, scientific research, education, and promotion of landscaping with native plants. In 2014, the Santa Barbara Botanic Garden established the Native Choice Award to recognize leadership by an individual or organization in the use of California native plants in a designed landscape and celebrate the people and the plants that make Santa Barbara uniquely beautiful.